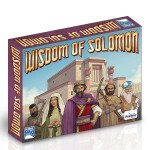 King Solomon reigned over the kingdom of Israel during its golden age. He commanded tribute from Israel’s neighbors, expanded Israel’s borders, built roads and fortresses, and kept the peace within the land. His merchants filled the kingdom with exotic goods such as spices, ivory, apes, and peacocks. Perhaps most famously, Solomon also built the Temple in Jerusalem, a golden place of worship lasting hundreds of years.